We are just about finished writing out the thank you notes for E's party. 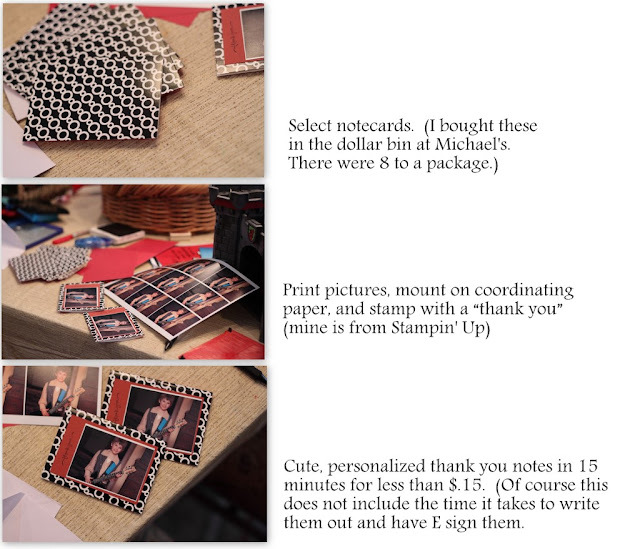 The actual writing part is not too quick, but putting the cards together is fast and easy. Here is a step by step of what I usually do. Michael's usually has a great selection of preprinted notecards in the dollar bin. I like to pick up a couple packages whenever I see them; it makes things a lot easier when we have cards to send out. I suppose we could just send out generic thank yous or perhaps not send thank you notes at all, but for me, it's part of the fun, and I think it teaches the kids to be grateful and appreciative for what they have.